"'A kingdom at risk, a crown divided, a family drenched in blood. The king's three daughters—battle-hungry Gaela, master manipulator Reagan, and restrained, starblessed Elia—know the realm's only chance of resurrection is to crown a new sovereign, proving a strong hand can resurrect magic and defend itself. But their father will not choose an heir until the longest night of the year, when prophecies align and a poison ritual can be enacted. Refusing to leave their future in the hands of blind faith, the daughters of Innis Lear prepare for war—but regardless of who wins the crown, the shores of Innis will weep the blood of a house divided." The Queens of Innis Lear is a fantasy reimagining of the classic Shakespeare play "King Lear." I'm not overly familiar with the story of King Lear myself--I've read it, but it was so long ago that I hardly remember a thing. Before jumping into this one I checked out some reviews to see if it was necessary to know the play, and most said that said knowing the general plot points of the play is helpful in fully enjoying this book, but not necessary, so I opted to read it without a refresher and I had no issues whatsoever. I'm sure I missed out on some King Lear-related subtleties, but I had no problem enjoying this book or following along with the story. The most prominent thing about this book is the prose itself, which is beautiful, elegant, and extensive in style. This makes for a rather dense read that really forced me to slow down and appreciate the writing as much as the story itself. Personally, I really liked the prose and thought it made for a gorgeous story. This style isn't everyone's preference, though, and I think this is partially what caused a lot of people to give this book a lower rating; if you don't mind some drawn out and descriptive prose, however, then I implore you to give this one a shot. Another shining part of this book is the cast of characters. I am floored by how deftly Gratton created these well-developed, fully fleshed out characters that are all strong and and powerful in their own way, none of which ever felt stereotypical or cliche'd. The three sisters that prove the main focus of the plot are Gaela, Reagan, and Elia. These three women are phenomenal and each have their own unique form of power that is expressed in very different ways and effects, but still holds its own at the end of the day. Elia is the youngest and has stayed by her father's side while her other two sisters have essentially divorced themselves from him. Outwardly, she could be seen as the weakest of the bunch, the most sensitive and 'gentle,' but this would not be an accurate description of her as the story goes on. Elia has a quiet strength that erupts from her only when necessary. Reagan is described as being the 'manipulator,' and that is completely accurate. She is sly and rather devious, but always maintains a sense of authenticity that makes her shine with vibrancy. Reagan is someone that I would always want on my side, but at the same time I'm not sure I'd fully trust her. Lastly is Gaela, the eldest and also the most physically powerful. She is the warrior of the three and is constantly training and ready for any battle. She does not want to be shackled by the 'limitations' of regular women, such a giving birth and dealing with menstruation, so she makes sure these are not issues for her. Even though each sister does things that are good, bad, and everything in between, I still felt myself drawn to them and completely invested in following their every action. There's a lot more that I can say about the other characters in this book as well, such as King Lear himself, Ban the Fox, Rory, Morimaros, and others, but in order to not make this review endlessly long I'll simply say that they are just as carefully and intricately crafted as the three sisters. If strong, well-written characters, then this is definitely a book to keep on your radar. The way Gratton weaves each character into the other's story line and gives them such meaningful roles in this story is fascinating. The setting often takes place in a forest or forest-surrounded area, which adds to the darkly beautiful tone of the book. There is always a deeper meaning to things that are said and the events of this book were very obviously created with great care. It's apparent that Gratton knew what she was doing when writing this book and planned out every last action to make everything stand out wonderfully, and it certainly paid off. 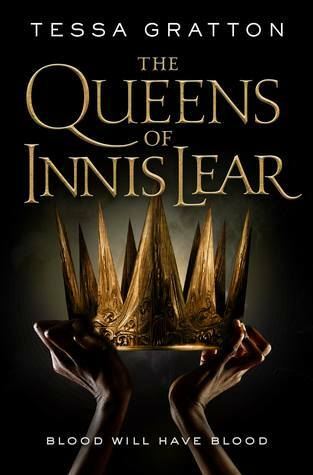 Overall, I've given The Queens of Innis Lear 4.5 stars! If you have a little patience and are looking dive into a beautifully told story with lush scenery and fully developed characters, then you couldn't find a better book than this one. Oh YAY I am so happy to see that you liked this one so much! I love a character driven book, so I am hoping that it'll work for me. And the atmosphere sounds very on point too! Great review, I hope to get to this one soon! I'm so pleased to see you enjoyed this one! I've seen quite mixed reviews so far but I'm hoping to read it soon - you've definitely whet my appetite for it. I really want to read this at some point, I'm so glad to see you rated it so highly! I'm not well versed in Shakespeare either so good to know I can go into this without reading the play first.